A year after the Halloween party responsible for the world’s worst pumpkin pie, my housemates expressed a desire to host another party, “but this one should be a full dinner.” I offered to cook, asked for possible menu suggestions, but received no response. When we were just four days away from the hypothetical party, I asked to meet with everyone to figure out what we would be cooking. My usual seat at the kitchen table faced away from the sink, which was about five feet behind me and to my right. Once I sat down, I sensed someone else staring at me. When I turned to the sink, I saw a head hanging over the edge of the counter. “Is that a pig’s head?” I asked. “Have a look for yourself.” I did, and it was. For once the sink was not filled with dirty dishes – it was filled with pig. “Not me. Time to consult The Book of Saint Julia.” I found a recipe for roast suckling pig in my battered paperback of The French Chef Cookbook, and spent the next two days gearing up for the big event. I made Walt clean and shave the pig, then we both had to figure out how to fit it in the oven. It would just fit along the diagonal, but we had to construct our own roasting pan by cutting down and stapling together four disposable aluminum roasters and covering the structure with an entire roll of heavy duty foil. 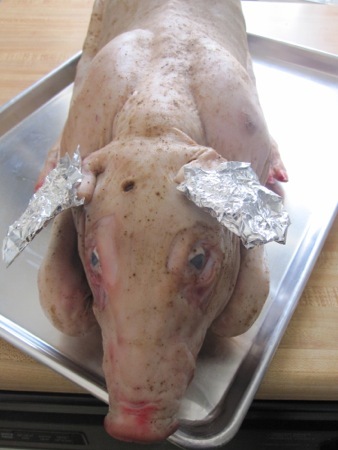 Early in the afternoon of the party I stuffed the pig, trussed it with two packages worth of metal skewers, and stuffed the mouth open with a ball of foil. I had no choice but to rely on Julia’s times and temperatures, and much to my relief they worked. After a brief rest we moved the roasted pig to a platter (actually a slab of plywood covered with foil), stuffed an apple in its mouth (that’s what the foil ball was for), and brought it upstairs to show our guests before carving it. The pig was delicious. All of our guests loved it – all but one, who declared “That was a whole lot of work for a special effect.” She was never invited back to the house. Flash forward 27 years, to when I began planning She Who Must Be Obeyed’s birthday dinner. I had been considering a whole hog themed dinner when I learned that Rick, one of my old housemates (who also shares a birthday with She Who), would be attending. If I cooked a whole pig there would be four people at the table who had been present at the original pig roast.
. 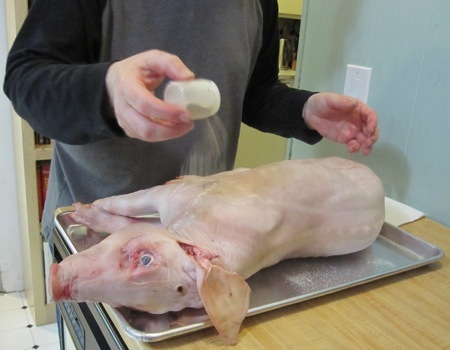 I gave my 16-pound piglet a rubdown with seasoning made form sea salt and quatre épices (equal proportions of white pepper, cloves, nutmeg, and ginger). 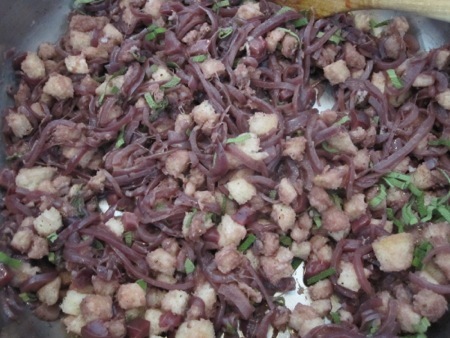 I made a stuffing with bread, red onions, sage, red wine, and diced kidney. I was supposed to use the kidneys from the pig, but I wasn’t provided with them. Fortunately, like all of you, I always have a few extra pig kidneys in the freezer. 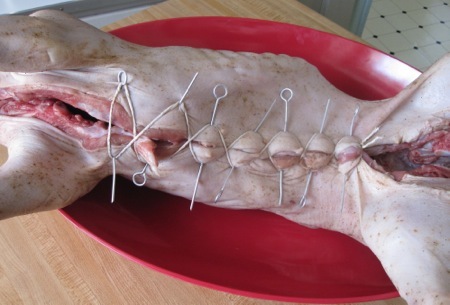 As I stuffed and trussed the pig, I realized that the metal skewers I used were the same set I bought for the same purpose 27 years ago. I chose to interpret that as a good omen. 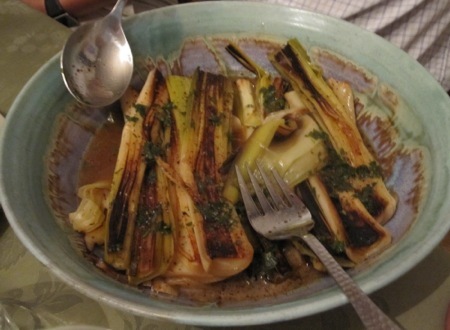 Once again the pig would have to sit diagonally in my oven, but this time I had a large enough pan – a three-quarters sheet. 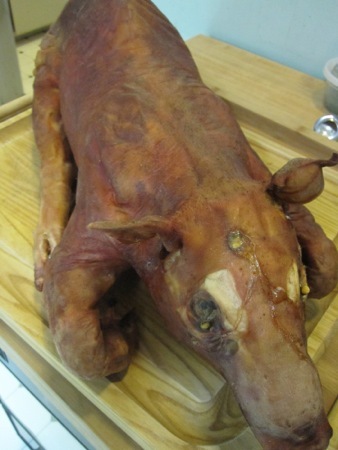 In honor of the original feast I paraded the pig around the dining room before carving it. 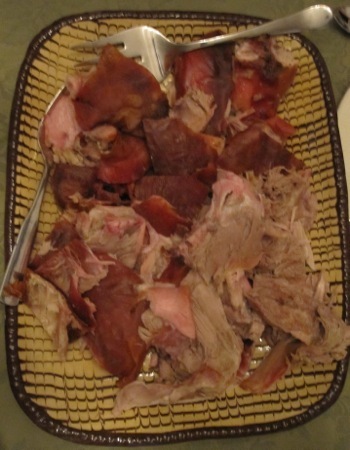 A pig that small is mostly bones (which became the base for a porky, gelatinous ramen stock), with the majority of the meat coming from the upper legs, belly, and two small loins. 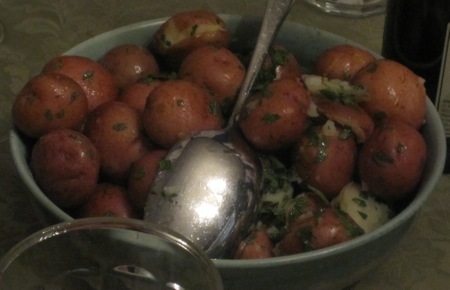 I plated plenty of crispy skin and both of the ears, offering the cheeks to the two birthday honorees. 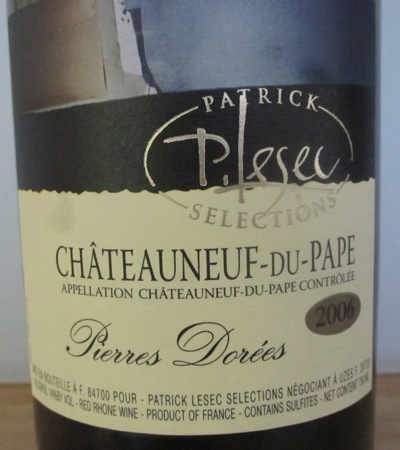 We washed it all down with a Châteauneuf-du-Pape. How did it taste? How can you go wrong with perfectly roasted pork? I’m confident that our guests enjoyed the meal, but, having heard the story of the original party, may have chosen not to criticize out of fear of being banned from future events. 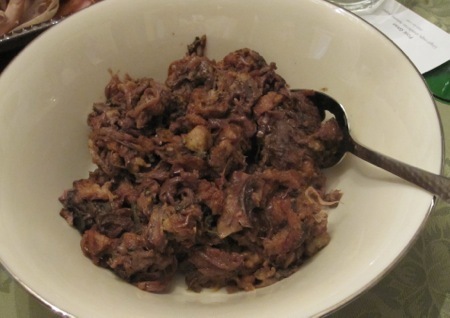 This entry was posted in food & cooking and tagged cooking, food, pig. Bookmark the permalink. I know it’s true for you. I do love the kidneys. I don’t think I could fit even a suckling pig in my oven. Was the crackling very satisfying? If you have a standard-sized oven, the pig would fit. Thanks to my convection oven and a healthy oil rubdown, the cracklings were awesome. I also love the Bloomfieldesque picture of you and the little guy.